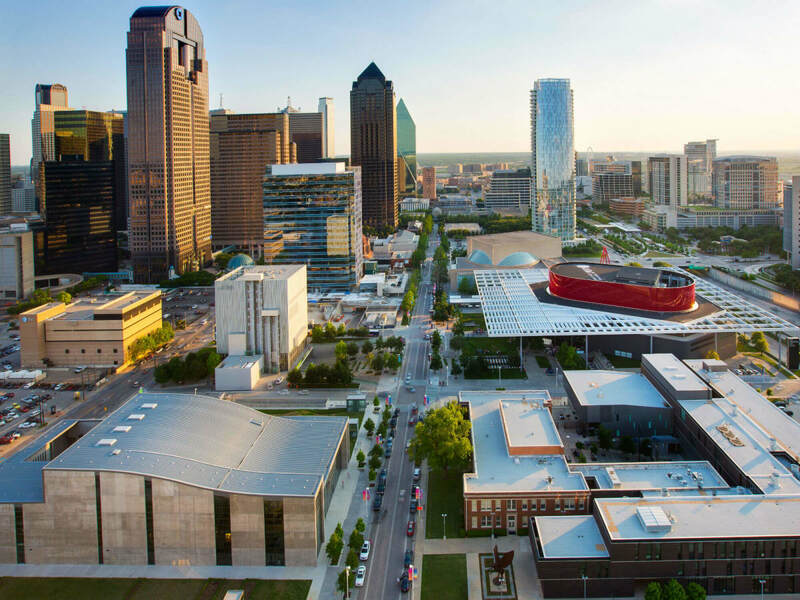 Krieger, principal in the architecture firm NBBJ, intends to remedy all that -- and then some -- with a new master plan for the Dallas Arts District, which will replace the 33-year-old Sasaki Plan that provided the initial framework for the 17 blocks between Uptown and downtown. The new plan will make its formal bow Monday afternoon at Dallas City Hall. The plan, in the works for almost a year, imagines the Arts District as a vibrant, connected neighborhood filled with shops, restaurants, residences and, most of all, people who aren't simply headed to or from the Dallas Museum of Art or the Winspear Opera House or the other venues that make up the district. "We have these world-class institutions providing a number of free and world-class programs in their institutions," said Lily Cabuta Weiss, the former artistic director at Booker T. Washington High School for the Performing and Visual Arts who in April was named the Dallas Arts District's executive director. Copying these posts from the Flora and Olive thread so we can get a general discussion going about the Arts District. I was wondering about the same thing, especially since the Arts District says they want more residential there. So where would it go? The big opportunities would be the Two Arts site, across Ross at the Spire site and the two Hall sites on either side of Ross. Someone could offer to build out the remainder City Performance Hall and put residential on top. Maybe the church would let someone redevelop their annex if they got a school out of the deal. Not sure how you would motivate the Dallas Bar to let you renovate the Belo annex. Here is the link to Spire, which has shown no life whatsoever this cycle. Looking at the renderings from the NBBJ plan in the DMN article, notably absent is KWP's proposed flyover bridge on Pearl St. The bridge is contrary to this proposal, which would make the Arts District flow into KWP and north and south on Pearl, and I hope the omission means the bridge won't happen. ...Among the master plan's key components: shrinking Pearl from six to four lanes as it heads south from Woodall Rodgers Freeway, renaming it the "Avenue to the Arts," extending its curbs into the intersection and adding public art along the route; remaking the sidewalks along Flora while planting better lights, hardier trees and a water feature; and making room for mixed-use developments that would bring life to street level. The plan also envisions turning the Routh Street overpass into an actual gateway... expand the boundaries of the Arts District all the way to the Pearl/Arts District light-rail station. ...The Arts District hopes some of that — $18.9 million, for phase one — comes from the 2017 bond package. So, the bond packaged passed, but did that include money for phase one of a new master plan for the Arts District? Renaming streets is usually just silly to me, Pearl should be Pearl all the way, not "Avenue to the Arts" for part of the way (Avenue to the Arts?!?! gag me with a spoon). Still not sure about making room for mixed use developments. Whatever happened about finishing the City Performance Hall? The Moody Performance Hall is a lyrical and elegant multi-use performing arts venue with a mission to provide an exceptional opportunity for local emerging and mid-sized arts organizations to express the voice of our community through the performing arts. Hunt: The DMA garage was planned so that it can double in size, double in size underground. So that is something that we really need to consider and look at. I know the DMA got a redesign on the westside parking garage entrance, but did the garage double in size? How do you double in size an underground garage? Plus why is the first time we have heard this? Oh, that's right Klyde Warren claimed they needed more money to build a floating parking garage over the freeway. Depending how foundations were laid, what the ground underneath a building is like, etc, it is possible to extend a structure downward, in this case potentially doubling the capacity of an underground parking structure. I hadn't heard anything about this though and it's certainly not trivial to do so. They may have also walled off portions of it, and could possibly restripe portions of it (to make the parking spots smaller) and decrease turning radii and alternate exits. Wow, "Avenue to the Arts" is an awful name. I'm ok with it if it's an alternate name (ie - the Magnificent Mile aka Michigan Avenue in Chicago), but a complete rename is weak. That name was abandoned a while ago. Keep in mind the link Tamtagon provided is from before 2010. Before the Wyly and Winspear even opened. cowboyeagle05 wrote: That name was abandoned a while ago. Keep in mind the link Tamtagon provided is from before 2010. Before the Wyly and Winspear even opened. The reference to the "Avenue to the Arts" name was in the November 2016 DMN article originally linked by Tnexster. FWIW, the June 2017 draft Master Plan still has multiple references to "Avenue to the Arts" although it speaks of "reinterpreting" and "transforming" Pearl Street into "Avenue to the Arts". It does not specifically say it is to be renamed. Thank you for clarification Tucy! Avenue of the Arts has always seemed more of a city projection that of course has never taken root in the public or even Arts district officials. No one is saying meet me for lunch on the Avenue of Arts for a number reasons including a bulky name. To me, it reads more as a way to give a name to some design details that can be applied to public spaces along that designated route in city planning design guidelines. I like the name Flora as the central avenue in the Arts District so I hope that never gets wiped out. Is the City Performance Hall on any sort of schedule for expansion within the next ten years? I'm kinda wondering if those blueprints will be modified to something different. tamtagon wrote: Is the City Performance Hall on any sort of schedule for expansion within the next ten years? I'm kinda wondering if those blueprints will be modified to something different. I'd love to see more work on it, and maybe reconfigured for some more even smaller more affordable spaces. Theater Row in NYC has some spaces as small as 20-99 seats, which lend themselves to independents and smaller experimental works. And they've fostered many new shows that have gone on to fill larger theaters and become hits. There's no reason to ignore the smaller local companies in which originality flourishes. In my mind, those starving artists are more the true heartbeat of the creative community. even without red carpet and chandeliers. sterling wrote: In my mind, those starving artists are more the true heartbeat of the creative community. even without red carpet and chandeliers. I'd love to see more work on it, and maybe reconfigured for some more even smaller more affordable spaces. Theater Row in NYC has some spaces as small as 20-99 seats, which lend themselves to independents and smaller experimental works. I'm not sure if all the retail space is occupied, but would it make sense to try to convert one of the spots into one of these small theater concepts? That may be a completely idiotic idea from a business standpoint (I have no clue), but something that came to mind when thinking of smaller spaces. I love storefront theaters and unexpected bldgs turned into performance spaces. Unfortunately, the theaters seem to disappear as the real estate they occupy becomes popular. Higher rents are the ironic death knell for many companies who may have been partially responsible for bringing their locations into the limelight. The nice thing about "dedicated spaces" is that they're less likely to become offices or other businesses. As tough as theaters are to build, they're also difficult to turn into something else. Maybe we'll have a new Master Plan for the Arts District that reaches into Old East Dallas toward Deep Ellum. The Latino Cultural Center is primed to expand and anchor further Arts District facilities; it's embarrassing that Dallas does not have a Museum of Latin America. The smaller city performance spaces could inch closer to the wilder part of town and have a nice coupling with live music, less formal city gallery spaces would fit well with the wilder part of town... maybe even a notion for the Dallas Contemporary Museum to open Phase Two on Good-Latimer somewhere. "Midtown Arts Theater Center Houston" is an interesting take on building theaters without the usual smoke, mirrors and vast air-conditioned lobbies. An indoor/outdoor arrangement features several different sized spaces under a huge canopy that does double duty as informal gathering space before and after performances. Small foyers entered from underneath the canopy lead directly into the theaters, eliminating the need to heat and air condition a lobby a block long. I wish the City Performance Hall would take a serious look at fleshing out it's future plans similarly. It might get finished sooner. At the very least, the info could have a positive informational effect on planning future performance venues. The Dallas Arts District is a bona fide magnet for millennials. A new study from apartment search website RentCafé ranks the Arts District as the top ZIP code in Texas for the share of millennial residents. U.S. Census Bureau data gathered by RentCafé indicates 65 percent of the residents in the Arts District’s 75201 ZIP code, or about 8,800 people, were millennials in 2016. That makes it the No. 1 millennial hot spot in Texas and the No. 8 millennial hot spot in the U.S.
Kyle Baugh, a Realtor with Briggs Freeman Sotheby’s International Realty, says the Arts District — a walkable area sandwiched between Uptown Dallas and downtown Dallas that offers a mix of apartments and condos — appeals to the live-work-play vibe coveted by many young Dallasites. The 2012 opening of Klyde Warren Park contributed to that vibe, he says. The RentCafé study bears that out, as downtown Dallas’ 75202 ZIP code comes in at No. 15 on the list of U.S. strongholds for millennials, with a millennial share of 61 percent, or 1,400 residents. I live at the intersection of Ervay and Pacific, which is within 75201 but is definitely not within the Arts District. The only residential that I can think of that is truly within the Arts District is very high dollar. Ummmm 75201 encompasses far more than the Arts District, and most of the residential in this zip is outside of the Arts District (I'm also in 75201). 75201 is the entire eastern half of Downtown, southern part of Uptown (Lower McKinney), Harwood, and part of Victory Park. Those areas are chock full of millenials. Arts District, not so much. Something tells me "Kyle Baugh, a Realtor with Briggs Freeman Sotheby’s International Realty" is trying to sell some of those ultra expensive Arts District condos. Matt777 wrote: Ummmm 75201 encompasses far more than the Arts District, and most of the residential in this zip is outside of the Arts District (I'm also in 75201). 75201 is the entire eastern half of Downtown, southern part of Uptown (Lower McKinney), Harwood, and part of Victory Park. Those areas are chock full of millenials. Arts District, not so much. Something tells me "Kyle Baugh, a Realtor with Briggs Freeman Sotheby’s International Realty" is trying to sell some of those ultra expensive Arts District condos. I was thinking the exact same thing! Of course the article would leave out the true geographical extent of 75201 in order to hype up the Arts District. As a Millennial who lives further up in Uptown, the only draw for me in that immediate area is Klyde Warren Park. I typically bypass the Arts District on my way down to Main St. There are nice qualities to the Arts District, but I completely disagree with the article that it's a destination for urban artists. Try Deep Ellum. dukemeredith wrote: I live at the intersection of Ervay and Pacific, which is within 75201 but is definitely not within the Arts District. One arts apartments aren't high dollar.